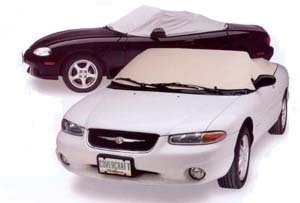 Easy to use protection for convertibles when the top is down. Interior covers protect the windshield and interior from damaging UV rays, airborne pollutants, and droppings from trees and birds. Interior covers are easy to install and include an anti-theft tab that locks inside the trunk. Compact size, easy to store. Interior covers are installed with the side windows down. Available to custom fit most popular convertibles. For information on the differnt materials, see the corresponding car cover. These covers are made from the same material.